“Please don’t be a Civ V clone.” I repeated the mantra, over and over, as I waited for Endless Legend to install. All the press releases and preview videos couldn’t put that single idea out of my head. I saw a hex based tile system, city building, units moving around the map, and I feared the worst would come to pass. I imagined a scenario where Amplitude Studios – best known for Endless Space and Dungeon of the Endless – merely re-skinned Civ V with orcs and dragons. Oh me of little faith. Rarely have I ever been so happy to be so wrong. When I started the tutorial, I saw the game map rise from a flat surface. Forests, mountains, and my lone city stretched skyward like in the opening credits of Game of Thrones. As this visual effect pulled me in, I felt my fears about the game eroding. The tutorial, which some might find a little text-heavy, walked me through the nuances of this complex and elegant game in about fifteen minutes. It left me to lead one of Auriga factions, or one of my own making, to glory or desolation. Rather than fiddle with perks and racial bonuses, I picked one of the prefab races, the Valuters – a people predisposed to research and a scientific victory. Would brains triumph over brawn? Well, no, not so much, but most of that was my fault. Because like so many good 4X games (explore, expand, exploit, and exterminate), the tutorial teaches you how to play, but not how to win. Winning is the dominion of experience and failure. And if I learned nothing else during my first 100 turns with Endless Lengend it’s that failure can still be a lot of fun. For all the beauty to behold in Auriga and its various races, there’s an equal amount of intelligence under the hood. Where something like Civ V would lead a player by the nose, suggesting you “build a city here, stupid,” Endless Legend is content to leave those decisions entirely up to the player. Building a new city, or expanding an existing one, requires studying the resources on the map, considering what a city contributes, or could contribute, to the empire, and acting accordingly. Do you want the city to be a beacon of commerce? Then you’d best build near a river with heavy dust – the game’s version of gold – deposits. Want a city that will facilitate rapid mid-game expansion? Then find a spot with food as far as the eye can see. Though you may want to avoid my mistake of building a first expansion amid a hostile minor faction that has three villages within marching distance of my vulnerable colony. I spent far too much of my time trying to pacify some rat-men, who were so stupid and vicious that I had no diplomatic options for placating them. By the time I made contact with the major factions, they pitied my people for their insignificance. Seriously, pity. Never before have I played 4X game where an AI opponent’s overall mood toward my faction was “pitying.” It was as if the AIs were telling me, “Yeah, we could invade you, but really, what’s the point? You’re no threat and we don’t stand to gain anything by taking your territory.” I’m not sure how much longer that attitude would have lasted if I played on, mind you. I also found myself wishing I had played a race more disposed to combat. Where combat was cinematic in Endless Space, it did get a bit repetitive and dull. 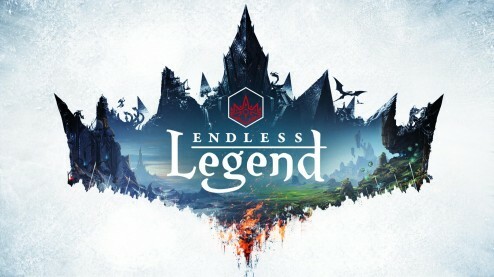 Not so in Endless Legend. Armies move about the map in stacks, which then break up into individual units when combat is joined. From there, the combat is tactical – albeit a little fussy in the execution. Individual units jockey for position, making use of high ground or rough terrain like in any other hex-based war game. Combat stats are determined by the customizable weapons, armour, and equipment assigned to a unit. Using advanced weapons, however, has to be balanced against the available natural resources, which can be used en mass to trigger powerful empire-wide bonuses. Endless Legend is a positively gorgeous game, but behind that beauty is a seemingly strong AI, and an expectation that you, dear player, will be able to keep up with it. Combat is much improved from Endless Space, and very reminiscent of a tabletop war game without the pens, paper, and dice rolling. The predominant gameplay motif is balance. Being predisposed to science is no reason to neglect commerce or military development. I should probably try to do the missions the game gives me, rather than ignoring them and doing my own thing. They not only guide a civilization’s development, but also offer a sense of narrative for each of the factions in play. I want to spend some more time Endless Legend before offering up a full review. Sufficed to say, my first impressions are very positive. When Civilization: Beyond Earth releases at the end of the month, I think Endless Legend will be the game people measure it against, and that means Civ:BE is up against some stiff competition.